For many years, the question of “best goaltender in NLL history” has had two answers: Bob “Whipper” Watson and Dallas Eliuk. Some say Dallas, some say Whipper, some can’t decide between the two. It’s rare that you hear someone other than one of those two described as the best ever. But the question of Whipper vs. Dallas as the best ever may soon become outdated. Nothing’s being clarified, however; the waters are getting even muddier. Weird aside: Here’s an odd one for @NLLFactOfTheDay: A starting goalie has finished a season with a sub-10.00 GAA only 17 times in NLL history. Matt Vinc has done it four times. Nobody else has done it more than twice. Yet Vinc didn’t lead the league in GAA in any of those four seasons. And here’s the craziest part: in 2010, Vinc finished with a GAA of 9.51, the seventh best of all-time, but he finished fourth in GAA that season. Vinc has won five Goaltender of the Year awards, while Watson won only two and Eliuk never won any. This is, of course, meaningless since the award didn’t exist before 2001. Eliuk’s career was more than half over by the time the award came into being and from 2002 until the end of his career, his teams were generally pretty lousy. (His 2008 LumberJax made the finals, but Eliuk was the backup goalie by then.) Having said that, Watson won the 2008 Goaltender of the Year award on a sub-.500 team that missed the playoffs. When comparing players’ careers, I never compare the number of Championships they won. That is entirely a team statistic and has no bearing on whether one individual player was better than another. Brodie Merrill has never won an NLL title but he’s arguably better than an awful lot of players who have. 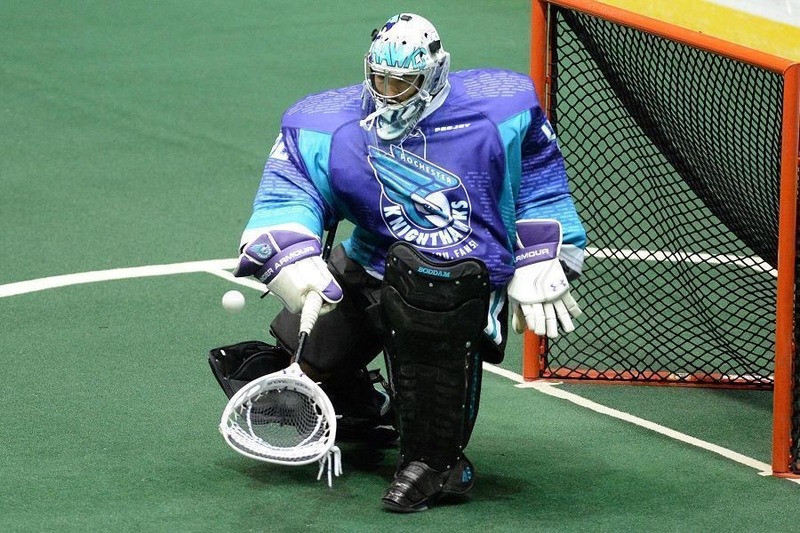 But if you must know, Eliuk won six with the Wings, Watson six with the Rock, and Vinc three with the Knighthawks. If we’re going to compare these three goalies, shouldn’t we just compare their stats directly? Let’s try. Vinc has a lifetime GAA of 10.88. Watson’s was 11.14, while Eliuk was 12.24. So Vinc’s GAA is 0.26 lower than Watson and 1.36 lower than Eliuk. Pretty clear that he’s the best of the three, right? Actually, no. During Dallas Eliuk’s career spanning 1992-2008, the average number of goals scored in an NLL game was 25.66. During Bob Watson’s career from 1998-2011, the average dropped to 24.82, and during the Matt Vinc years from 2006-2018, the average was only 23.41. Eliuk had a higher GAA because more goals were scored in general during his career (2.25 more per game) than during Vinc’s. Thus you’d expect Eliuk’s GAA to be higher than Vinc’s. If you assign half the difference in goals scored to each goalie, Eliuk would have a sort of “handicap” of 1.13 over Vinc, so the 1.36 difference in their GAAs is really only about 0.23. Similarly, Watson’s adjusted GAA is actually lower than Vinc’s. I don’t have numbers for shots faced before 2005, so I can’t compare their career save percentages. But from 2005-2018, Vinc has a save percentage of 78.2%, third behind Steve Dietrich and Ken Montour (and a handful of others with just a couple of games played). Watson is only three players back of Vinc at 77.4% while Eliuk is a fair ways back at 75.9%. Again though, that only covers the last three years of Eliuk’s career, not his prime. Not that this is news, but there’s no really good way to compare players who played in different eras. Eliuk’s career and Vinc’s only overlapped by three years, but Eliuk was past his prime by then and Vinc wasn’t yet the standout goalie he would become. The game was different enough during the years before and the years after that statistics can’t be directly compared. Watson’s career overlapped both for a longer period of time but there is a twelve-year age difference between Watson and Vinc (and six years between Watson and Eliuk) so comparisons are still difficult. So which of the three is the best ever? There’s no correct answer – arguments can be made for any of the three. Maybe we have to say Eliuk is the best of the 1990’s, Watson the best of the 2000’s, and Vinc the best of the 2010’s, and leave it at that. The only thing we can definitively say is that this is no longer a two-horse race. The mid-to-late 2000’s were a tumultuous time in the NLL. Teams were popping up, moving, and vanishing all over the place. This all reached “peak weird” in about 2007-2008 and if you are new to the NLL, you might not know about all of these strange goings-on. Even if you’ve been following the league since then, some of this is still hard to believe.